I think I started this pencil drawing on a large piece of paper during a Mirage business meeting in 1992... something I used to do to try to accomplish two things at once. I'm not sure if it really worked, though. That is an awesome sketch! The x-straps work for the sketch. Very badass. 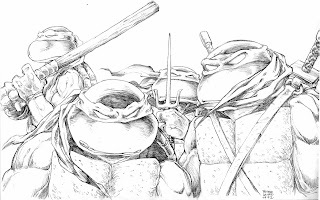 The Turtles look very menacing and I would not want to mess with them. -->> ..wish this was a nice big poster or Dynamic Forces print. amazing!!! this is amazing! i love your pencils Mr Laird.